This is an HTML version of a Technology Innovations in Statistics Education article. As statistics and data science instructors, we often seek to use data in our courses that are rich, real, realistic, and relevant. To this end we created the fivethirtyeight R package of data and code behind the stories and interactives at the data journalism website FiveThirtyEight.com. After a discussion on the conflicting pedagogical goals of “minimizing prerequisites to research” (Cobb 2015) while at the same time presenting students with a realistic view of data as it exists “in the wild,” we articulate how a desired balance between these two goals informed the design of the package. The details behind this balance are embodied as our proposed “Tame data principles for introductory statistics and data science courses.” Details of the package’s construction and example uses are included as well. It is against this backdrop that we present fivethirtyeight: an R package of data and code behind the stories and interactives at FiveThirtyEight. FiveThirtyEight.com is a data-driven journalism website founded by Nate Silver and owned by Disney/ESPN that reports on politics, economics, sports, and other current events. FiveThirtyEight has been forward-thinking in making the data used in many of their articles open and accessible on their GitHub repository page https://github.com/fivethirtyeight/data (GitHub is a web-based repository for collaboration on code and data). Our fivethirtyeight R package goes one step further by making this data and its corresponding documentation easily accessible, all with students in introductory statistics and data science courses that use R in mind. The homepage for the fivethirtyeight R package can be found at https://fivethirtyeight-r.netlify.com/. The era of “Big Data” has led to renewed interest by the general public in the discipline of statistics. Given the increase in prominence of data-driven decision making in academia, industry, and government, there has been a corresponding increase in the number of statistics majors (American Statistical Association Undergraduate Guidelines Workgroup 2014). In parallel with this growth, college administrators are pushing many new data science/data analytics education initiatives; this demand for data-centric education is forecasted to continue well into the future (Manyika et al. 2011). Correspondingly, there has also been a rise in the availability and accessibility of laptop computers, open source statistical and computational tools, open source learning materials, and open data licenses. This has led to students being increasingly freed from the physical constraint of computer labs centered around desktop machines using proprietary commercial software, allowing them to work in physical settings and environments that they are more comfortable in. Additionally, given the open source nature of many new pedagogical tools, instruction manuals are increasingly being replaced with crowd-sourced approaches to help and documentation, such as GitHub and StackOverflow, opening up a wide world of support. Statistics educators must capitalize on this renewed interest in the field, the rise of data science/analytics, and the increased availability and accessibility of technological tools to convey the importance of many critical statistical concepts to a new generation of students and practitioners, including distributions, sampling error, uncertainty, and modeling (Cobb 2015; Nolan and Lang 2010; DeVeaux et al. 2016). In particular, one opportunity for experimentation with new pedagogical approaches, as espoused by the Guidelines for Assessment and Instruction in Statistics Education (GAISE), is to “integrate real data with a context and purpose” into the classroom (GAISE College Report ASA Revision Committee 2016). Such integration of real datasets in the classroom has long had many advocates (Gould 2010). One overarching goal we shared when designing courses is Cobb’s principle of “minimizing prerequisites to research” for students, where “research” in this context does not necessarily imply research suitable for publication in academic journals, but rather simply “answering questions with data” (Cobb 2015). Cobb argues that students should be exposed to real and substantive data analysis as quickly as possible, even if this entails simplifying certain important topics at first and pushing aside others until later in the curriculum. Otherwise, Cobb argues we risk alienating a large number of students early on, thereby never allowing them to be exposed to the great potential of data analysis to answer questions on topics they may be curious about. This concept is further illustrated in what Grolemund and Wickham refer to as the “data/science pipeline” in Figure (Grolemund and Wickham 2017). We feel that it is important to expose students to all these elements of this statistical/data science analysis cycle, from data importation right through to the communication of the results, and not just certain portions of the pipeline as is often the case in many introductory courses. This thinking is in line with Perkins’ philosophy of “making learning more meaningful by teaching the ‘whole game’” instead of just isolated pieces of a discipline (Perkins 2010). So just as how aspiring softball/baseball players first learn to play a simplified version of the game called “teeball” instead of only learning how to swing a bat, we feel that introductory statistics and data science students should be exposed to the entirety of the data/science pipeline early, even if only in a simplified form. Another overarching goal we shared when designing courses is emphasizing the use of “real world” data. Dr. Jenny Bryan at the University of British Columbia and RStudio has famously quoted that traditional data used in the classroom is like a “teddy bear,” whereas real world data is more like a “grizzly bear with salmon blood dripping from its mouth” (Jedamski 2015). To shield students from the wrangling and pre-processing necessary to prepare data for analysis is to ultimately do students a disservice, as we would be blinding them to the reality that many statisticians and data scientists spend a substantial amount of their time performing such tasks (Lohr 2014). These two goals, to ‘minimize prerequisites to research’ while also using real-world data, however, are in direct conflict with each other. On the one hand, one cannot expect novices to immediately tackle many raw datasets as they exist “in the wild,” thereby placing barriers to research at a time where there is high risk of alienating them. On the other hand, to present students with datasets that are overly curated would betray the true nature of the work done by statisticians and data scientists. We argue instead that a careful and thoughtful balance between these two goals is essential when preparing datasets for use in introductory statistics and data science courses. As a means to this end we created the fivethirtyeight package, whose features and basic uses we present in Section 2. In Section 3 we present discussions on how we set the balance between these two goals and how this balance translated to the ultimate design of the package. These ideas are embodied in our proposed: “Tame data” principles for introductory statistics and data science courses. Many canonical datasets, such as iris, UCBAdmissions, Old faithful, and anscombe’s quartet have long been available for use in R. Other datasets, such as mtcars and diamonds, are used by many R packages as common examples to demonstrate the package’s functionality. More interestingly, many newer and larger datasets are included in R packages devoted exclusively to their dissemination, such as nycflights13, babynames, gapminder, and okcupiddata (Horton, Baumer, and Wickham 2015; Wickham 2017a; Bryan 2015; Kim and Escobedo-Land 2015). Disseminating data via R packages has numerous advantages, in particular standardized web-based installation and relatively simple data-loading procedures. Made the data easy to load: All data is loaded from an R package, instead of through the importing of comma separated values (CSV) files, Excel spreadsheets, and other file formats. A thorough description of the observational unit and all variables. If documented, the data sources. A link to the original article on FiveThirtyEight. We felt that inclusion of these links was critical to provide information on the data’s context, thereby emphasizing how “real” the data are. Made the data easy to explore: We pre-process the data “just enough” to balance between the two conflicting goals from Section 1.2, thereby providing students access to data that is both “rich” and “realistic”, but not so much so that we run counter to the goal of “minimizing prerequisites to research.” We explicitly define what is meant by “just enough” in the Section 3: “Tame Data” Principles for Introductory Statistics and Data Science Courses. Made example data analyses easy to access and reproduce: We include crowd-sourced data analysis examples in vignettes written in R Markdown, available at https://fivethirtyeight-r.netlify.com/articles/. We demonstrate the most basic use of the package: viewing the contents of a dataset and opening its help file. As an example, we view the bechdel dataset and its corresponding help file, which contains a link to the original FiveThirtyEight article “The Dollar-And-Cents Case Against Hollywood’s Exclusion of Women” (Hickey 2014b), a codebook describing all 15 variables, and other information. Read the original FiveThirtyEight article and any other necessary supplementary materials for context. Look over the help file for the dataset to know what variables they have access to. Perform an exploratory data analysis of the hate_crimes data by visually inspecting the raw values, computing summary statistics, and creating visualizations. Run regressions with either of the above outcome variables to investigate which state-level demographic features are associated with hate crimes. Summarize their findings in written form. Relationship between hate crime incidence and income inequality. What is the Gini index? Students might not be familiar with this measure of income inequality, necessitating outside investigations (on Wikipedia for example). What mechanisms generated the outcome variable? For example, how did the SPLC compute their counts as compared to the FBI? Are these counts based on actual numbers of hate crimes or reported numbers of hate crimes? There were four states that did not have hate crimes measures (Hawaii, North Dakota, South Dakota, and Wyoming) yielding four NA missing values. What is the nature of this missingness? Is there something particular about these four states? The plot indicates one clear outlier in the relationship between hate crimes and income inequality. Upon further investigating this outlier can be identified as the District of Columbia (DC). What is different about DC when compared to the 50 states? Are their populations different? Does DC’s extremely small geographical area and urban nature answer this question? The regression table suggests that there there is a positive association between hate crimes and income inequality. However, how much is this is driven by DC’s outlier value? Furthermore, what does the traditional interpretation of a slope coefficient \(b_1\) (for every increase of 1 unit in \(x\), there is an associated increase of on average \(b_1\) units of \(y\)) mean in this case when the Gini index itself is a value between 0 and 1? What might be a more informative interpretation of the slope coefficient? The other component of the fivethirtyeight package is our use of package vignettes. Vignettes are included in many R packages as long-form guides and extended documentation to supplement existing help files (Wickham 2015). In this package, we use vignettes not for documentation purposes, but as example data analyses based on the datasets included in the package. They are written in R Markdown, a notebook-style file format that weaves together narrative text and code to produce elegantly formatted output (Allaire et al. 2017). Since the written text and source code are included in the same document, users can easily reproduce the analysis in its entirety. There are at least two named female protagonists. They talk to each other about something other than a male protagonist. The raw data files can also be found in https://github.com/rudeboybert/fivethirtyeight/tree/master/data-raw. In the same directory, all .R files prefixed with process_data_sets_ contain all the source code to pre-process the raw data. At the time of publication of this article, there were three such files (process_data_sets_albert.R, process_data_sets_chester.R, and process_data_sets_jen.R); in the future we anticipate having more. Use only lower case characters and replace all spaces with underscores. This format is known as snake_case and is an alternative to camelCase, where successive words are delineated with upper case characters. If converting the raw data to “tidy” data format alters the dataset too much, then make the code to convert to tidy format easily accessible. By advocating for the shielding of novices from such pre-processing, we are not arguing for their diminished importance in a data scientist/statistician’s toolkit. Rather we argue that these are intermediate topics that should be left to later in the curriculum, either later in the same course or in a later course altogether. We have found in our experience that students are better motivated to learn such intermediate topics only after they have had a chance to develop basic data intuition and perform elementary data wrangling, visualization, modeling, and analysis. Furthermore, we note that while some of these principles are statistical language/software independent, many are specific to R and thus they should be viewed in the context of a course syllabus centered around the use of R. We present examples of four of these five principles in application and demonstrate the advantages they yield for novice R users, using both base R and tidyverse-centric approaches (Wickham 2017d). Whereas the first three subpoints relating to data frame and variable naming are more cosmetic in nature, the fourth principle relates to an R-specific issue faced by novices. Variable names that include spaces require different treatment than those that do not, specifically the use of tick marks when referring to them. While this is a topic R users eventually have to learn, we argue that it is not an immediate priority. #>  "How often do you travel by plane?" #>  "Do you ever recline your seat when you fly?" #>  "How tall are you?" #>  "Do you have any children under 18?" We see that in the latter case the variable names are much shorter and cleaner. This simplification leads to much less cumbersome code to wrangle and visualize this data. For example, consider the following two ggplot() commands to generate the barplot in Figure to visualize the relationship between the two categorical variables of interest: using the raw data necessitates tick marks to access the variables, whereas using the latter data doesn’t. Attitudes about bringing babies on a flight. Although recent advances such as the lubridate package have made wrangling dates much easier, performing such tasks can still be very challenging for students who have not had experience (Grolemund and Wickham 2011). In datasets where only a numerical variable indicating the year exists, it can be argued no pre-processing is necessary. However, when a month and/or day variables exist along with a year variable, we argue that pre-processing should be done. Specifically, they should be combined and converted to Date objects. This allows for easy creation of time series plots with well formatted x-axes and for performing of basic date arithmetic. As an example of the importance of preprocessing dates, consider the data corresponding to the FiveThirtyEight article “Some People Are Too Superstitious To Have A Baby On Friday The 13th” (Bialik 2016) of the number of daily births in the United States between 1994 and 2003. The raw data corresponding to this article is saved in CSV format on FiveThirtyEight’s GitHub repository page https://github.com/fivethirtyeight/ and can be accessed via the shortened bit.ly link http://bit.ly/2vgRFiw. We load this data, filter for only those rows corresponding to 1999 births, and save this in a data frame US_births_1999_raw. The raw data is saved in a format that makes it difficult for novices to create a time series plot. Furthermore, people do not typically think of the day of the week (Sunday, Monday, etc) in terms of a numerical value between 1 and 7. In contrast, when using the pre-processed US_births_1994_2003 data frame from the fivethirtyeight package we observe that there is a variable date, which can be treated as a numerical variable. This allows for the date variable to be plotted with informative tick marks on the x-axis as in Figure . Furthermore, the day of the week is indicated with more informative text rather that values between 1 and 7. Number of US births in 1999. Much as the FiveThirtyEight article suggested that there are relatively fewer births on Fridays that fall on the 13th because many parents avoid inducing labor on that date for likely superstitious reasons, a plausible explanation for the spike of births on 9/9/99 is that parents were choosing to deliberately induce labor on that date given its aesthetic appeal. In our experience, among the earliest questions students pose when creating data visualizations involving a categorical variable (such as barplots and boxplots) is “How do I reorder the bars/boxes?” This is because the default alphabetical ordering of a categorical variable is often not intuitive. While there have been many recent advances in dealing with factor variables in R such as the forcats package (McNamara and Horton 2017; Wickham 2017b), we argue that the reordering of categorical variables is still sufficiently too complex for novices that it would run counter to Cobb’s philosophy of “minimizing prerequisites to research.” Rather, we suggest that this topic should only be addressed after students have developed a basic familiarity with R. Therefore when pre-processing the datasets for this package, we represented ordinal categorical variables as ordered factors with the appropriate levels, categorical variables with a fixed and known set of levels as regular factors, and categorical variables whose possible levels are either unknown or of a very large number as characters. As an example of the importance of preprocessing categorical variables, consider again the data corresponding to the FiveThirtyEight article “The Dollar-And-Cents Case Against Hollywood’s Exclusion of Women” (Hickey 2014b) of Bechdel Test scores of gender representation for various movies. This article includes Figure , showing the breakdown of Bechdel Test results for movies in 5-year time periods. A key observation is that within each bar corresponding to a 5-year time period, the vertical ordering of the blue and red segments matches the hierarchical nature of the five possible Bechdel Test outcomes. For example, the question of whether female protagonists talk about something other than male protagonists is only relevant if the movie has more than two women and the women speak to each other. We now reconstruct this graphic using the data provided by FiveThirtyEight using both the raw data saved in CSV format on FiveThirtyEight’s GitHub repository page https://github.com/fivethirtyeight (accessible via the shortened bit.ly link http://bit.ly/2uD3ls6) and using the pre-processed version in the fivethirtyeight R package. In both cases, we discretize the year variable into 5-year bins using the vector year_bins and plot a stacked barplot of proportions. 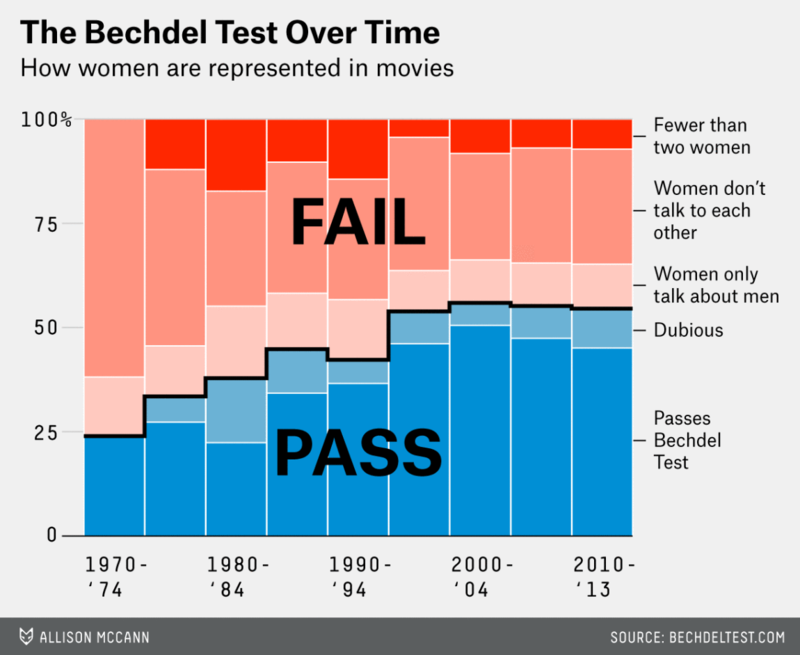 Barcharts of Bechdel Test results across time. We observe in the top plot of Figure based on the raw data has the uninformative default alphabetical ordering of the Bechdel Test outcomes, whereas the bottom plot in Figure based on the pre-processed bechdel data from the fivethirtyeight package has the correct hierarchical ordering of the outcomes. This format is also known as “long/narrow” format, as opposed to “wide” format. While the information contained in a dataset is identical irrespective of it being in “tidy” format or not, the chief benefit of these format guidelines is that they act as a set of standards for the input and output format of many different functions in many different R packages, in particular those in the tidyverse suite of R packages for data science. These guidelines are espoused in the first principle of the “tidy tools manifesto” to “reuse existing data structures” (Wickham 2017c). By following this formatting guideline, all datasets in the fivethirtyeight package fit seamlessly into the tidyverse ecosystem of R packages, in particular the ggplot2 package for data visualization and the dplyr package for data wrangling. Converting datasets to “tidy” format in R necessitates understanding of the gather() and spread() commands of the tidyr package. We argue that the topic of converting between wide data format and tidy/long format is best left to an intermediate stage of learning, given the relative complexity of the necessary commands. Therefore we pre-processed all data in the package to follow the tidy data format. For datasets where we felt converting the data to tidy format would alter them too much from their original form, we include the gather() code necessary to convert them from wide data format to tidy format in the @examples section of the corresponding help files. For example, say we want to create a barplot comparing consumption of beer, spirits, and wine between the United States and France using the drinks dataset corresponding to the article “Dear Mona Followup: Where Do People Drink The Most Beer, Wine And Spirits?” (Chalabi 2014) The data is saved in “wide” format and thus cannot be used in the ggplot() function. This formatting of the data now allows itself to be used as input to the ggplot() function to create an appropriate barplot in Figure . Note in this case since the number of servings is pretabulated in the variable servings, which in turn is mapped to the y-axis, we use geom_col() instead of geom_bar() (geom_col() is equivalent to geom_bar(stat = "identity")). USA vs France alcohol consumption. One immediate application of this package for instructors is to increase the data-centricism of their courses with minimal disruption to the syllabus. The data are easy to load via an R package and the help files contain contextual information, including a description of all variables and a link to the original article. For courses with a data science component, the datasets can provide students opportunities to “flex their data science muscles,” in particular those relating to data visualization and wrangling. For example, Ismay had their SOC 301 Social Statistics students at Pacific University use these datasets for their group projects, which can be accessed at https://ismayc.github.io/soc301_s2017/. Finally, as stated in Section 2.3, for courses where data wrangling is a learning goal in and of itself, the source code converting the raw data to tame data format can be used as examples for students to learn more sophisticated data wrangling tools, such as those needed to wrangle dates and strings/text data. Additionally, this package is being used in other statistics and data science pedagogical initiatives. Ismay and Kim have incorporated this package into “ModernDive: An Introduction to Statistical and Data Sciences via R” (Ismay and Kim 2017a), an open source, fully reproducible electronic textbook available at http://www.moderndive.com. Ismay is creating a companion DataCamp course “Effective Data Storytelling Using the tidyverse” (Ismay and Kim 2017b); DataCamp is an online interactive environment for learning data science currently via R and Python. Albert Y. Kim was an assistant professor of statistics at Middlebury College in Middlebury, Vermont, where he was a statistician in the Department of Mathematics. He taught an introductory statistics class that acts as a service class for disciplines needing their students be adept at statistical thinking. He is currently a Lecturer of Statistics at Amherst College, and will be joining Smith College as an Assistant Professor of Statistical and Data Sciences in the fall of 2018. Chester Ismay was formerly a Data Science/Statistics Consultant and Visiting Assistant Professor of Mathematics at Reed College. He also taught Social Statistics for the Sociology Department at Pacific University. Prior to moving to the Portland, Oregon area, he taught introductory statistics, data analysis, probability, mathematical statistics, and introduction to computer science as the lone statistician at Ripon College. His focus has been and remains to be improving the communication of statistics and data science via clear visualization and careful, deliberate analysis. He is currently a Data Science Curriculum Lead at DataCamp. Jennifer Chunn was formerly a full-time lecturer at Seattle University in the Albers School of Business and Economics. She taught required introductory statistics and regression courses to Business undergraduate majors, as well as a senior-level Applied Econometrics elective. In addition, she incorporated examples from the fivethirtyeight package into her Data Visualization and Statistical Modeling course in the Executive MBA program. She is currently a Manager of Data Science and Analytics at Nordstrom, Inc. The authors would like to thank Alicia Johnson, Maia Majumder, Nicholas Horton, Nina Sonneborn, Andrew Flowers, and Hadley Wickham for their input and feedback. Allaire, JJ, Joe Cheng, Yihui Xie, Jonathan McPherson, Winston Chang, Jeff Allen, Hadley Wickham, Aron Atkins, Rob Hyndman, and Ruben Arslan. 2017. Rmarkdown: Dynamic Documents for R (version R package version 1.6). https://CRAN.R-project.org/package=rmarkdown. American Statistical Association Undergraduate Guidelines Workgroup. 2014. “2014 Curriculum Guidelines for Undergraduate Programs in Statistical Science.” Alexandria, VA: American Statistical Association. http://www.amstat.org/asa/files/pdfs/EDU-guidelines2014-11-15.pdf, last accessed August 7, 2017. Bialik, Carl. 2016. “Some People Are Too Superstitious to Have a Baby on Friday the 13th.” 2016. https://fivethirtyeight.com/features/some-people-are-too-superstitious-to-have-a-baby-on-friday-the-13th/. Bryan, Jennifer. 2015. Gapminder: Data from Gapminder (version R package version 0.2.0). https://CRAN.R-project.org/package=gapminder. Chalabi, Mona. 2014. “Dear Mona Followup: Where Do People Drink the Most Beer, Wine and Spirits?” 2014. https://fivethirtyeight.com/features/some-people-are-too-superstitious-to-have-a-baby-on-friday-the-13th/. Cobb, George. 2015. “Mere Renovation is Too Little Too Late: We Need to Rethink our Undergraduate Curriculum from the Ground Up.” The American Statistician 69 (4): 266–82. DeVeaux, Richard, Mahesh Agarwal, Maia Averett, Benjamin Baumer, Andrew Bray, Thomas Bressoud, Lance Bryant, et al. 2016. “Curriculum Guidelines for Undergraduate Programs in Data Science.” The Annual Review of Statistics and Its Application 4: 15–30. GAISE College Report ASA Revision Committee. 2016. “Guidelines for Assessment and Instruction in Statistics Education (GAISE) in Statistics Education (GAISE) College Report College Report 2016.” Alexandria, VA: American Statistical Association. http://www.amstat.org/education/gaise, last accessed August 7, 2017. Gould, Robert. 2010. “Statistics and the Modern Student.” International Statistics Review 78 (2): 297–315. Grolemund, Garrett, and Hadley Wickham. 2011. “Dates and Times Made Easy with lubridate.” Journal of Statistical Software 40 (3): 1–25. http://www.jstatsoft.org/v40/i03/. ———. 2017. R for Data Science. O’Reilly Media. http://r4ds.had.co.nz/. Hickey, Walt. 2014a. “41 Percent of Fliers Think You’re Rude If You Recline Your Seat.” 2014. https://fivethirtyeight.com/datalab/airplane-etiquette-recline-seat/. ———. 2014b. “The Dollar-and-Cents Case Against Hollywood’s Exclusion of Women.” 2014. https://fivethirtyeight.com/features/the-dollar-and-cents-case-against-hollywoods-exclusion-of-women/. Horton, Nicholas J., Ben Baumer, and Hadley Wickham. 2015. “Setting the stage for data science: integration of data management skills in introductory and second courses in statistics.” CHANCE 28 (2): 40–50. Ismay, Chester, and Albert Y Kim. 2017a. “An Introduction to Statistical and Data Sciences via R.” 2017. http://www.moderndive.com/. ———. 2017b. “Effective Data Storytelling Using the ‘Tidyverse‘.” 2017. https://www.datacamp.com/courses/effective-data-storytelling-using-the-tidyverse. Jedamski, Derek. 2015. “Twitter.” 2015. https://twitter.com/d_jedamski/status/631150332941332480. Kim, Albert Y., and Adriana Escobedo-Land. 2015. “OkCupid Profile Data for Introductory Statistics and Data Science Courses.” Journal of Statistics Education 23 (2): 97–107. Lohr, Steve. 2014. “For Big-Data Scientists, ’Janitor Work’ Is Key Hurdle to Insights.” New York Times. https://www.nytimes.com/2014/08/18/technology/for-big-data-scientists-hurdle-to-insights-is-janitor-work.html, last accessed August 7, 2017. Majumder, Maimuna. 2017. “Higher Rates of Hate Crimes Are Tied to Income Inequality.” 2017. https://fivethirtyeight.com/features/higher-rates-of-hate-crimes-are-tied-to-income-inequality/. Manyika, James, Michael Chui, Brad Brown, Jacques Bughin, Richard Dobbs, Charles Roxburgh, and Angela Hung Byers. 2011. http://www.mckinsey.com/business-functions/digital-mckinsey/our-insights/big-data-the-next-frontier-for-innovation, last accessed August 7, 2017. McNamara, Amelia, and Nicholas J. Horton. 2017. “Wrangling categorical data in R.” The American Statistician. Nolan, Deborah, and Duncan Temple Lang. 2010. “Computing in the Statistics Curricula.” The American Statistician 64 (2): 97–107. Perkins, David. 2010. Making Learning Whole: How Seven Principles of Teaching Can Transform Education. Jossey-Bass. Wickham, Hadley. 2014. “Tidy Data.” Journal of Statistical Software 59 (10): 1–23. ———. 2015. R Packages: Organize, Test, Document, and Share Your Code. O’Reilly. http://r-pkgs.had.co.nz/. ———. 2017a. Babynames: US Baby Names 1880-2015 (version R package version 0.3.0). https://CRAN.R-project.org/package=babynames. ———. 2017b. Forcats: Tools for Working with Categorical Variables (Factors) (version R package version 0.2.0). https://CRAN.R-project.org/package=forcats. ———. 2017c. “The tidy tools manifesto.” https://cran.r-project.org/web/packages/tidyverse/vignettes/manifesto.html, last accessed August 7, 2015. ———. 2017d. Tidyverse: Easily Install and Load ’Tidyverse’ Packages (version R package version 1.1.1). https://www.tidyverse.org/.